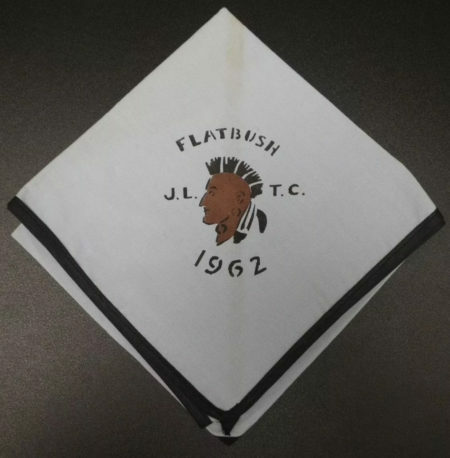 While many items from Buckskin Lodge #412 are moderately priced, a few of the odd shapes and neckerchiefs seem to have been issued in much lower quantities and command a higher price. 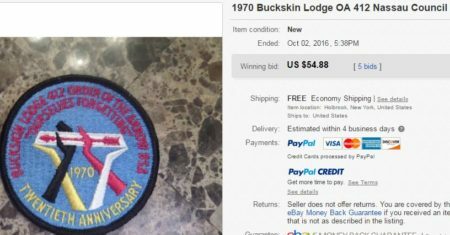 One of these items, in this case a Buckskin Lodge #412 20th Anniversary Round, the R3 recently ended on eBay. Clicking on the image will bring you to the auction results for the next few weeks. This lot started at $ 19.99 and 5 bidders each bid once to try to win this seldom seen patch. When the auction ended, the final price was just under $ 55.00. Ian Pinnavaia has been on a mission recently. He has come across what he believes is a previously unlisted Achewen Schingue Chapter issue from a JLTC in 1962. I picked up a N/C on eBay a while back which at the time was a total gamble on whether or not it could have been an issue of Achewen Schingue chapter or not. Before I bid I asked my Dad who had a vague recollection of it, and thought he had one in our collection already but surely we didn’t. I asked around to others like Bim Bxxxxxx, Hal (working for Uncle Sam at the time) and one or two more from the chapter who had a similar reaction to hosting a JLTC for the district, vague but nothing definitive. Since working with Colin and others to pull the lodge history book together last year I’ve been on a mission to fill gaps in Shu Shu Gah’s lodge officer history, vigil list and a few other areas where we may be lacking key pieces of information. Other Lodge’s may follow as time allows. 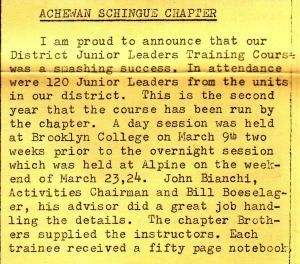 While reading old Blue Heron newsletters I came across an A.S. chapter report in a 1963 edition of the Blue Heron which cites the successfulness of running a JLTC for the past two years for the district. See the link below. 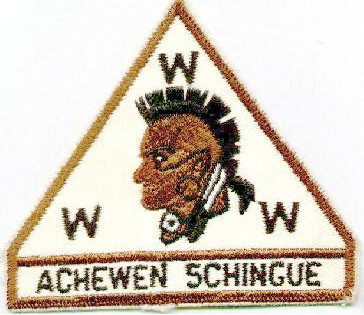 The Indian directly resembles the A.S. indian from the patches. A neat discovery just from thumbing through a few pages of the old Blue Heron’s for a completely unrelated reason. …that (the flap) was made to cover the cost of transportation for our contingent to attend the 2016 National OA conference NEXT at Indiana University. Only 55 pieces were made. The first 50 were sold to members @ $10 each. The remaining 5 will be put up for auction at our January annual banquet. 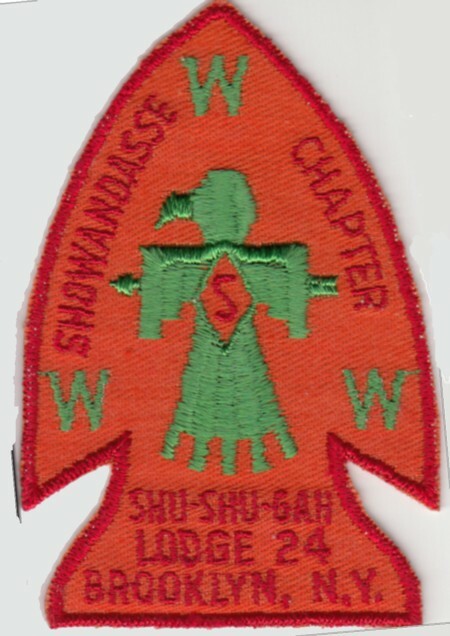 Two years ago, I was posting about an Identification Aide for the Shu Shu Gah Lodge #24 Showandasse Chapter A1 & A2. The most obvious difference is not noted. The length of “Chapter” is approximately 30mm. 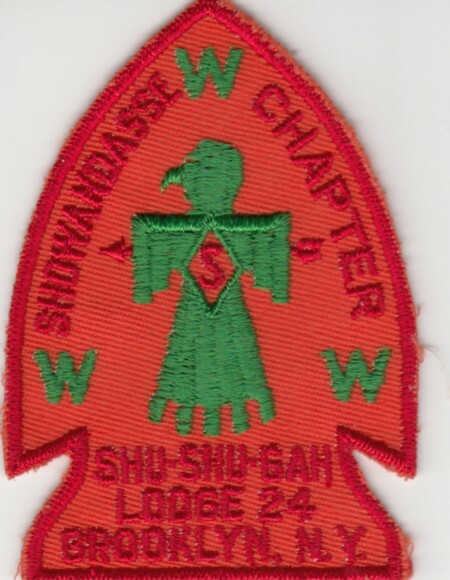 I’m always l;ooking for Shu Shu Gah Chapter patches and neckerchiefs. What do you have for trade or sale? Chenilles are there own collecting niche in our hobby. Here is a recently ended auction for one from Kamargo Lodge #294 their C1. Some Chenniles can sell for hundreds or thousands of dollars, this one had a bit more modest value. Bidding started at $ 34.99 and 3 bidders drove this to a closing price of $ 59.00. A bit less than the 294 C1 I posted on last October. I had previously written about the Section NE-4A 2013 conclave and showed the set of pocket patches issued for the event. 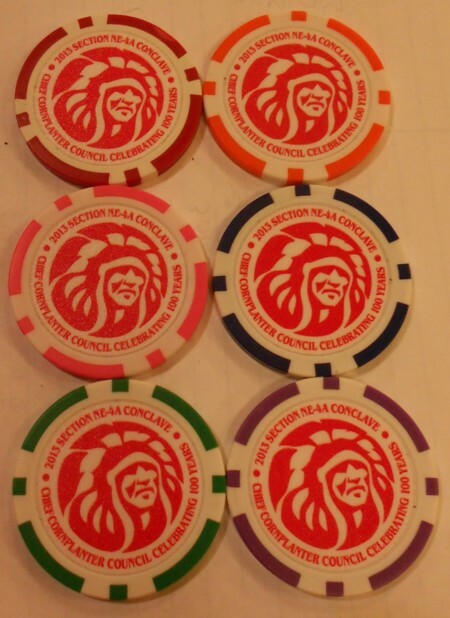 Jeff Jones sent along a scan of a set of poker chips issued for the conclave which mirrored the patch set. I need a set of these if anyone has them available for trade or sale. Ho-De-No-Sau-Nee Lodge #159 will celebrate its 50th Anniversary in 2017, and they have already begun to issue flaps to celebrate the event based on proposed designs dating back to 1967. Here is the first one issued earlier this year. My understanding is that this is supposed to be one of 4 throwback flaps, but the lodge did not like this version and is reordering slightly different designs. Not sure what will happen to the other original versions from this set.